Relaxing with Nelson Price (L) after being interviewed on his live radio show. 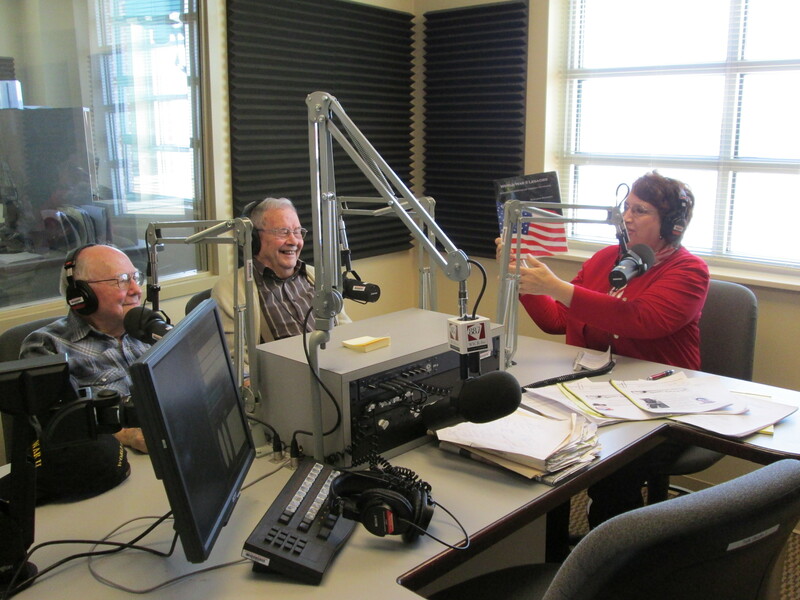 You can tell by the expressions on our faces that World War II vets Bob Foster & Don Shady and I enjoyed our time on the air last week with talk show host Nelson Price. Nelson is the host of a long-running live history talk show —Hoosier History Live! Hoosier History Live is the nation’s only live-with-call-in radio history show. It airs noon-1pm ET on WICR 88.7 Indianapolis or online. The studios are located on the campus of University of Indianapolis. Nelson has written several books on the subject of Hoosier (the word ‘Hoosier’ refers to someone from Indiana, for those of you not familiar with our state’s colloquialism) history. The topic of my book, World War II Legacies: Stories of Northeast Indiana Veterans, appealed to Nelson. 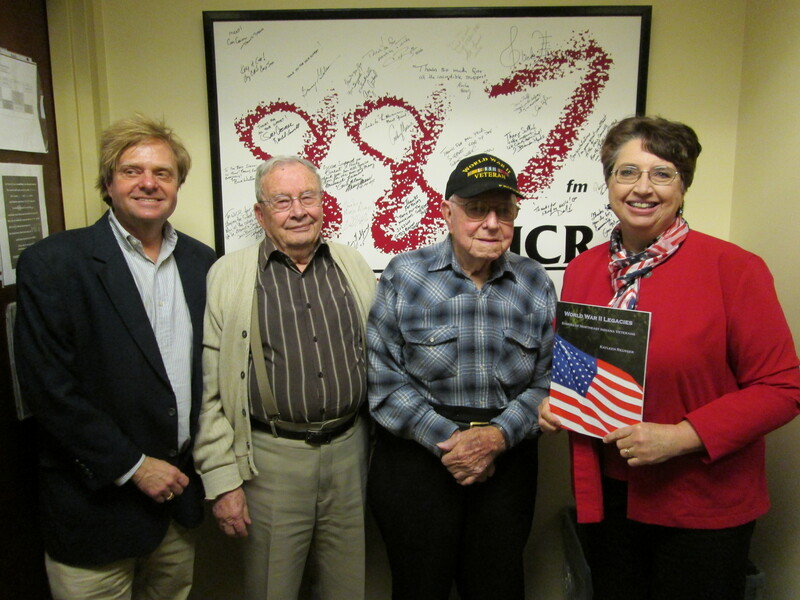 He graciously invited me to bring two World War II vets profiled in my book to the studio for a live radio interview. Talking on live radio was a new experience for Bob and Don. They did great! That meant driving 2 hours each way from northern Indiana where we live and where most of the vets from my book live. It was sure to be a long day, especially if weather was a problem. I was thrilled when Army Air Corps pilot Don Shady and Army vet Bob Foster consented to the trip. You don’t know how many prayers went up for good weather! Thankfully, it was a glorious day with sunshine and clear driving conditions. My wonderful husband, John, drove us to the campus. We were all a little nervous but Nelson’s professional attitude put us at ease. He had questions and a show format prepared and went over them with us before the show. The hour sped by and I was proud of Don and Bob for speaking well on the air. Lunch at Santorini Greek Restaurant with owner Jeanette Sawi was fun and delicious! It was a delight to meet the show’s producer, Molly Head. (That’s her peeking behind my shoulder) She and Nelson dined with us after the show at a nearby Greek restaurant. Santorini Greek Kitchen (1417 E. Prospect St, Indianapolis) was beautiful and a wonderful experience. I had never eaten Greek food except baklava and was not sure what to expect. The food was beyond our expectations. This photo shows just our salads, but we later ate delicious main dishes that I have no way of pronouncing or spelling here. Suffice it to say, we left the restaurant with full, happy stomachs! 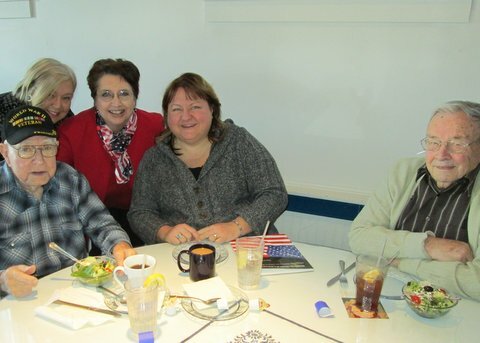 The restaurant owner, Jeanette Sawi, sat with us for a while and chatted with Don and Bob. I think we created lifelong memories with our visit! Thanks Jeanette and her husband, Taki, for a delicious meal and hospitality! 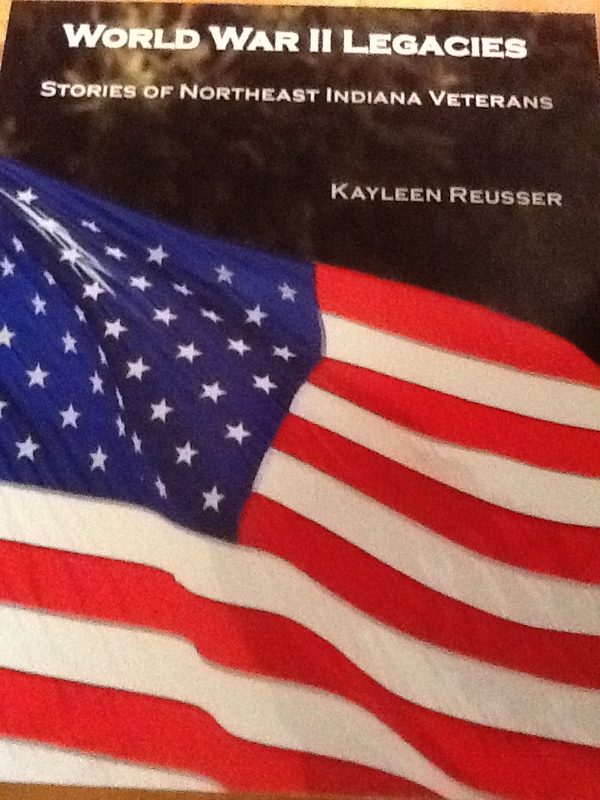 I’m booking speaking engagements now about my book, World War II Legacies: Stories of Northeast Indiana Veterans. If you know of a group that would like to know what it has been like to interview 75+ World War II vets and write a book about some of their experiences, contact me. xxxkjreusser@adamswells.comxxx (remove the X’s which are there to prevent Spam). The book is available now at the Paypal button on my site’s home page at top. It would be a perfect gift for a history lover, Baby Boomer or veteran. Take the time today to tell a vet thank you!